On September 19th, 2013 Eduardo Peña, our campaign coordinator for Latin America, gave a presentation on the use of legislation in protecting animals following which he was awarded with a certificate of recognition for his work at ADI by the Bar Association in Lima. The presentation featured examples of ADI’s successful campaigns in Latin America, including the recent victory in Colombia where a ban on the use of wild animals in circuses was won. On September 18th, 2013 at the request of Congressman José Urquizo, ADI participated in a series of workshops to discuss a Bill on Animal Protection and Welfare. This important initiative – which was broadcast live on the Congress channel – and the consideration of contributions by animal protection groups including Amazon Shelter, UPA, BYDA, Perú Antitaurino and Huaw, as well as ADI, is to be applauded. In July, President Alan Garcia signed into law an end to the use of wild animals in circuses, following an intense four-year campaign involving investigation evidence, scientific reports, videos, petitions, exhibitions and media work. The proposals were tabled several times and were knocked back for a variety of reasons, but persistence paid off when the bill was attached as an article to the Forestry and Wildlife Bill. We are now working with the Ministry of Agriculture on draft regulations to implement the ban, and arrangements for an animal census. A new video documentary from Animal Defenders International (ADI) “Unnatural Acts. Stopping the suffering in circuses in Peru,"has been screened in the Congress calling for support for an amendment to the Animal Protection Law number 27265 to ban animal circuses. On March 26 to 28, ADI took part of the II festival “Lima is not speechless” in the municipality of Pueblo Libre in Peru. The aim of the festival was to promote cultural activities and generate awareness of environmental issues in the country and worldwide. In order to drive the bill to ban animals in circuses to a successful end, ADI launched a public petition requesting the Spokesperson Board to table the bill in the agenda of the Plenary of the Congress. A year after launching a devastating exposé of the treatment of animals in circuses in South America, Animal Defenders International (ADI) stands on the brink of securing legislation to end this shocking abuse in Peru. At Congress on Tuesday 6th May, new legislation to end the suffering of animals in circuses in Peru will be unveiled by Congressman Mr. José Antonio Urquizo Maggia of the Nationalist Party and Congressman Mr. Alejandro Arturo Rebaza Martell of the Peruvian APRISTA Party. The new ADI report launched at the Congress in Lima reviews the scientific evidence on the effects of transport and captivity on animals that confirms their welfare is compromised – and this is the case for both domesticated and non-domesticated species. Disturbing new photographs of animals in South American circuses are included. Shocking video footage from inside animal circuses in Peru and other South America countries will be unveiled in Lima. A new report and video are based on the findings of a two and half year investigation by Animal Defenders International (ADI) of the treatment of animals in South American circuses. 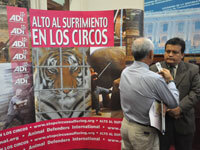 Photographs taken by ADI Field Officers inside traveling circuses in Peru. The campaign in Peru has been spearheaded by ADI sudamérica Campaigns Coordinator Juan Pablo Olmos and Jenny Mishty of Acción Por Derechos de los Animales (APDA), and now has the backing of the Peruvian animal protection groups Animazul, Grupo Caridad, Quimiranka, Animanaturalis and Unidos por los Animales UPA. Extensive television and other media coverage has been secured leading to bans in Lima municipalities and national legislation to ban animal circuses being tabled.